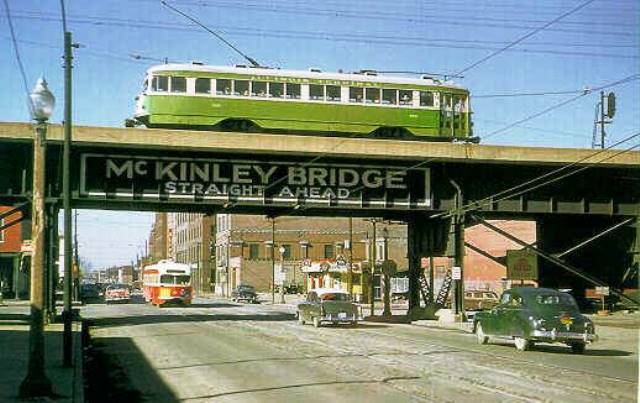 You’re looking at the railroad trestle over North Broadway at North Market St. in the late-1940s south of the McKinley Bridge. This point was a rare crossing of a Public Service streetcar (heading southbound on Broadway) and an Illinois Terminal Railroad car (up on the trestle.) The Illinois cars ran between Granite City and St. Louis from 1910 to 1958. It stopped in Venice and Madison along the way. The Great Rivers Greenway hopes to transform the trestle into a New York City High Line-style bike and pedestrian trail in the future. Click here for more details. Here’s the un-blurred image along with a modern day photo of this scene. How about that — you can still see the faded “McKinley Bridge” lettering on the bridge! 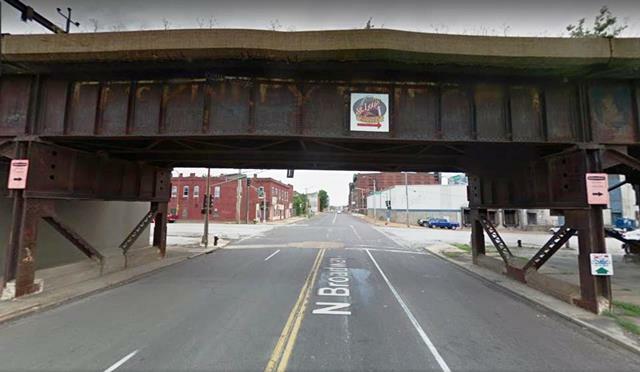 This is actually the railroad trestle over North Broadway at North Market St. in the late-1940s south of the McKinley Bridge.